Nature lovers recently had a chance to feast their eyes upon the striking Holly Blue butterfly. A Holly Blue butterfly at Glasswater wood. (photo by Bob Carter). The seasonal beauty dazzled onlookers at Glasswater Wood1 in Crossgar over the bank holiday weekend, at an event jointly organised by the Woodland Trust and Butterfly Conservation Northern Ireland. The Holly Blue was once a rare sight throughout Ireland, but has been expanding its range in recent years. Rosie Irwin, the Woodland Trust’s new contracts manager, enthused: “We were absolutely delighted to find that Glasswater Wood is home to the Holly Blue. These butterflies thrive in sunny, sheltered sites, and are an indicator that the habitat is good for a range of other species. * The Holly Blue emerges well before the other blue butterflies in spring. * It flies high around bushes and trees, unlike other grassland blues which tend to stay near ground level. * Caterpillars are usually green, but some may be camouflaged with pink-coloured stripes. 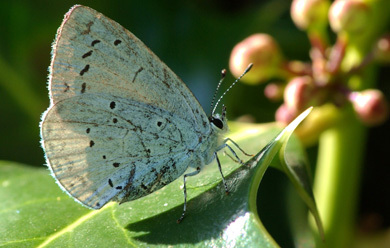 * Look out for the Holly Blue from mid-April until June. * The Holly Blue is easily confused with other blue butterflies. Look out for its sky-blue upper-side wings, and powder-blue under-wings with small black spots.